Scarfade® gel is an effective way of utilizing the healing properties of silicone in a convenient format that can be easily applied at home. The science behind the claims of this product is solid and based on years of research and development. Even if a scar cannot be faded completely, those who suffer with scarring are often pleased to witness even a small change in their appearance. Gel is designed to fade scars, not completely remove them. It requires application twice a day. A scar forms as part of the body’s natural healing process, where the skin specially produces ‘emergency’ cells to bind and seal the edges of a wound together. Scars can appear as a result of acne, surgery, an injury or any trauma to the skin that has caused the outer layer to open. Over time, most scars will fade, although this can take several years. There are various topical creams and gels available that assist the healing process, encouraging scars to fade more quickly. Medical silicone-based products have long been recognized for their ability to expedite the healing of scars. In 1989, Hanson Medical used this knowledge to create Scarfade®, a topical gel that is made from a special blend of medical grade silicones. This gel utilizes the healing power of silicone in a user-friendly and effective method. The FDA-registered product is available in a range of sizes, starting at $29.95 for a 0.5oz tube. It claims to reduce the size and intensity of scars, with visible results possible in just 2 weeks. The gel is applied to a scar once the skin has closed, during the active healing phase. 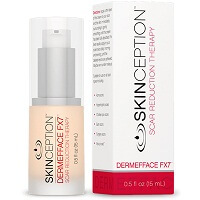 The unique silicone blend helps to regulate the growth factors, which causes the scar to reduce in size and appear less noticeable. A micro-thin layer of silicone ensures consistent skin contact, allowing healing to take place. The gel should be applied twice a day for around 12-16 weeks or until further changes in size and intensity is no longer apparent. While there is no harm in continuing to use the product after this point, there would be no advantage in continued use. A great advantage of Scarfade® gel is that it dries quickly and does not leave a sticky residue, so it can even be worn under cosmetics. The gel is easy to wash away with soap and water, and reapplication can take place as soon as the skin is dry. Only a small amount is required, as a standard 0.5oz tube should provide around 300 applications on a 3” scar. The gel is easy to apply, even on tricky joints such as elbows, where silicone sheeting would be inconvenient to use. Its gentle formulation is suitable for all areas of the body, even the face, and can also be used on children. With no known side effects, it is particularly ideal for those with sensitive skin. It can be used on any scars, although it will only be effective on those that are less than two years old. 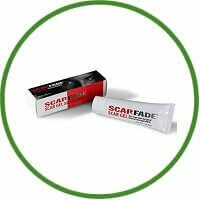 Scarfade® is backed by 10 years experience in the medical silicone industry. This solid reputation has resulted in it being regularly recommended to patients by their surgeons and dermatologists. The makers of this cream are so confident that its users will be satisfied that they even offer a money-back guarantee. User reviews for this acne scar cream are generally positive, with many satisfied reports from those who saw a visible fading of their scars within a few weeks. Many users were recommended this gel following surgery and were pleased with the results. As with any product of this nature, some users pointed out that it is difficult to tell whether the scar would have faded naturally during this time anyway. As a result, it is difficult to know exactly the extent to which the gel accelerated the healing process. Scarfade® gel is an effective way of utilizing the healing properties of silicone in a convenient format that can be easily applied at home. The science behind the claims of this product is solid and based on years of research and development. Even if a scar cannot be faded completely, those who suffer with scarring are often pleased to witness even a small change in their appearance. A noticeable reduction in size or colour can often make a big difference to a person’s self-esteem. 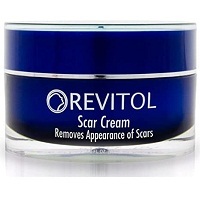 Using the gel is a painless way of treating the scar, without resorting to surgical procedures. With a money-back guarantee, this provides further peace of mind for those who are unsure whether the product will be suitable for them.